It's hard to work on a demo or a VRChat room without it constantly reminding you of the Rift, and in turn the DK2 I'm waiting on. There's that, and some of the things I want to work on right now just need a Rift. I'm mostly done with VRChat avatars for myself. And the well dried up (short of my goal for funding a new GFX card) on my freelance avatar work. So I don't have those to do instead. So, outside of one VRChat project, I've not been touching Unity much at all, and instead doing what I can to distract myself with other things like games and binge watching TV shows. I'd like to say when my wait is going to be over, but sadly I can't. Oculus' processing and shipping is just far to inconsistent and not being handled to well. 2 weeks ago I thought there was a good chance I'd get it this week. Last week that chance became minor, and instead next week looking like a sure thing. This week however went horribly and I'm now not even sure I'll get it in the next 2 weeks. Well, that's enough of that depressing stuff. I've tinkered with the Kokiri Forest demo a little, but not really done much. Instead I've brought Apieceoffruit in on it. He's excited to mess around and add bits to the demo. We'll see what becomes of that. I'm still at a point with Project: Ocarina where I don't want to touch it until I have my DK2. I've not really messed with much for VRChat avatars. All of my VRChat rooms have been at a standstill. Except for one though. Earlier this week I debuted, well, its not so much of a room. As a project, its more about a game inside of a room. 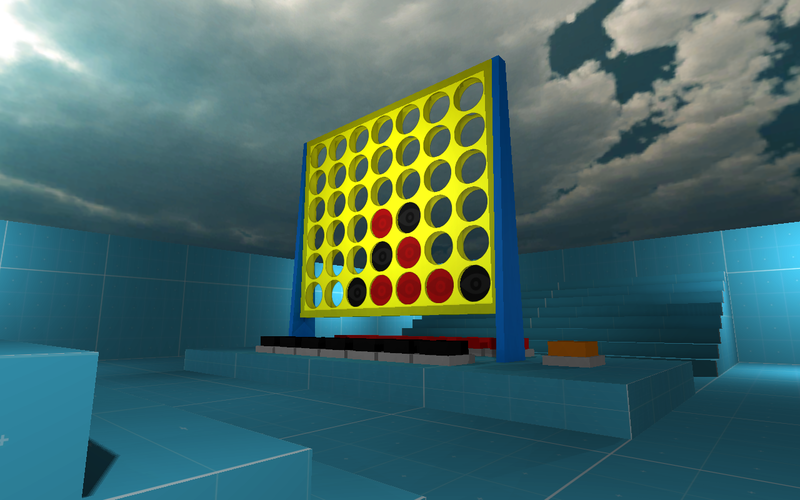 The intent was to make a table top type of game in VRChat, and for me to be able to drop it in any room I make. Like if I have a table in a room, I can just drop the game on it and compile the room. However, it hasn't worked out quite like that. It uses physics, and physics seem to break down in Unity when the scale of things are small. So I had to jumbo size the game. And this lead me to needing to put it in its own room. The game works. Tons of people have had some fun playing it. Hopefully soon VRChat web links will be working again, and the room can just be open for anyone to enjoy it. I may take another crack at it in a scaled down version. I have an idea on how to. But it's kind of a rewrite as it were, so not to enticing an idea atm. Perhaps during Oculus connect, I'll host it all day for those of us who can't attend. When I launched Z-Net I, the last average user count I saw from zbattle was WAY higher then what Z-Net I had ever gotten. I didn't expect all of that user base, but did expect a lot more then I saw. My unreleased Z-Net 3 supported many more emus than just NES and Genesis. But over all, I never got it to a state that was ready for public beta testing. It worked. And proved some concepts. But just barely, and that was it. I didn't want to believe it because I loved working on the programs, but the day of such a program is dead. I'd have to really hit it out of the park with some of my more grandiose ideas, which I sort of had planned for Z-Net 3. But honestly, I've moved on. I'm very happy with the projects I'm doing now and what the future may hold for me. I regret never achieving success, and never completing Z-Net 3. But not enough to resume work on them. I *might* work on Z-Band again at some point when bored. No clue if it will ever see a release. But its just something I enjoy working on from time to time.